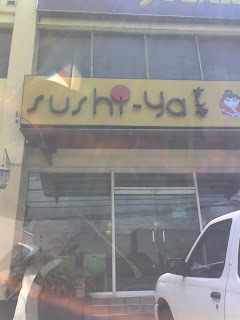 We had our lunch meeting today in Sushiya which is just around the corner, near our office actually. You can walk going there. It’s one of the favorite restaurant of some of my officemates, those who love eating healthy and diet foods. Osang love Tofu Furai and usually order it a lunch. Now after my boss’ travel in Taiwan with Joey, Win and Sir Bobby he invited us all managers and me to have lunch in Sushiya. Our group ordered special dimsum and because I’m not so much a lover of Japanese food I just ordered what I know is just right for me, I chose Calamares for my main dish. Since I’m fond of cooking and assessing food I find its taste quite simple not superb J. Meeting was mainly for some updates and some business opportunities for small telecommunications company like us in other parts of Asia. My boss joked about my resignation and wanted me to change my mind.